Mike S hijacking The Basement for a review of a film in a genre that I'm addicted to: animated. You might think that's odd for someone who loves horror movies the way I do. But that's just how I roll the potatoes. 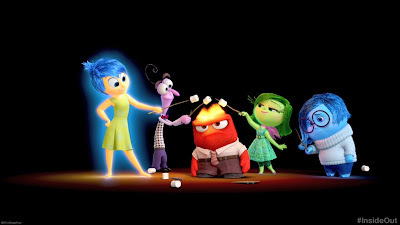 The first animated feature I'm going to review is 2015's "Inside Out" by Disney/Pixar. "Inside Out" is a return to what made Pixar one of the top animation studios in the industry. The story involving Riley and how events affect her emotions has depth and is one pretty much everyone can relate to in one way or another. The themes are solid, and firmly support the plot- both that of Riley's interactions with her parents & that of the emotions inside her head. The characters are interesting, well-performed, and like the story, relatable. They are also unique and distinct from each other, while still meshing together nicely. The cast has charm, and are genuinely likable. The voice acting matched each character perfectly as well- making them all the more believable. Like the best Pixar films, "Inside Out" blends humour, and tension together in an emotional tapestry that draws you into the story, and keeps you there until the end. It does this with a gentleness that sneaks up on you and makes the clock in your head stop counting the seconds until your Pizza Pops are ready. I really liked the art direction for this movie. The characters looked great. Each had personality and really exemplified the emotions they represented. I also liked how each looked unique, while still fitting in well with each other. The "set" designs were great too, with biological motifs spread throughout such as DNA helixes for the railings, the bends of the Long Term Memory shelves resembling the folds of the brain- and the ground itself having a slight... fleshy look to it. As an animation addict, I love when an animated feature can make me truly care about the story and the characters- which "Inside Out" does. I would definitely watch it again, and I'd certainly recommend others to watch it as well. I'm going to give it a "Good".